CASIT, The Center for Advanced Surgical and Interventional Technology, was conceived following the 1994 Northridge earthquake when it became necessary to build a replacement hospital at the Center for Health Sciences at UCLA. The design of the operating rooms and the interventional floors was a major challenge. The task was to try to predict the state of the art of surgical technology in the 21st century. Surgical technology was rapidly advancing. It was decided "the best way to predict the future was to invent it (Allan Kay)." A famous surgeon once said, "good judgment comes from experience, and experience comes from poor judgment." Gaining experience though poor judgment in the operating room is no longer acceptable in the 21st Century. With the new emerging technology we no longer have to rely on learning by real time experience. CASIT provides an environment where surgeons and trainees can practice or rehearse the operation virtually using advanced surgical simulators before they do the actual operation on the patient. This is analogous to the cockpit simulation training that pilots have been doing for years. Surgeons can learn to do complex patient specific operations in the virtual environment and not have to learn by practicing in the operating room. While musicians, athletes, and others practice and rehearse, surgeons traditionally have not rehearsed the surgery before the operation. With the evolution of the new technologies, the ability to create a virtual or simulated operation allows surgeons to rehearse the operation prior to going to the operating room and determine what the proper surgical procedure should be. 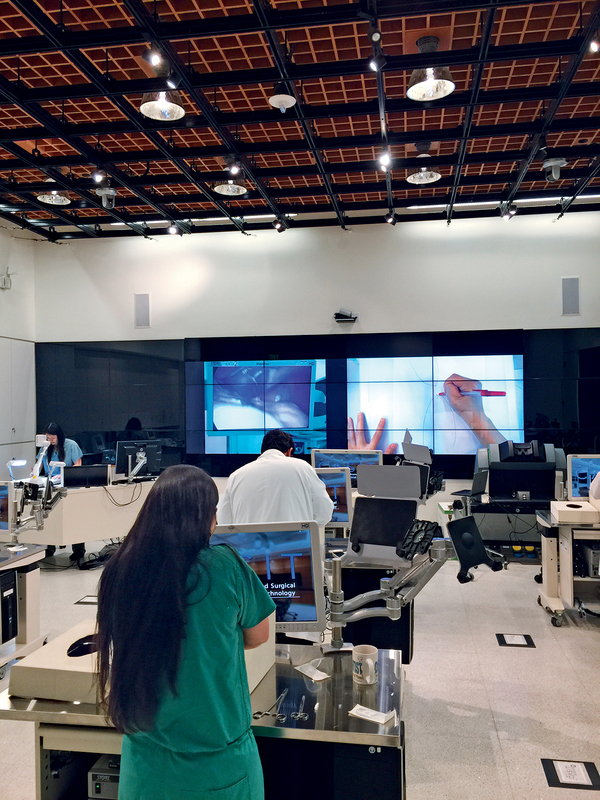 This allows young surgeons in training the opportunity to learn in the virtual environment. CASIT's mission is to define and advance the state of the art of surgical and interventional technology, to revolutionize surgical education and training, to enable the development of unprecedented accuracy and precision in the performance of minimally invasive procedures and to deliver novel, interventional therapies to patients. The goals are to revolutionize surgical training, enable the development of unprecedented accuracy and precision in the performance of minimally invasive procedures, to deliver novel surgical and interventional therapies to patients, to improve teaching and traing, and to develop a greater interventional capacity through robotics, informatics, and simulation. This requires involving engineers and other departments in the physical sciences, as well as the David Geffen School of Medicine at UCLA. It was key to develop partnerships with industry and include Bioengineering, the California Nanosytems Institute, Applied Mathematics, Cognitive Psychology, and Computer Sciences at UCLA. There is a close collaboration with the physical sciences (engineering, physics, applied mathematics, computer science) with the medical school faculty. The new training center covers all of the surgical specialties including general surgery, cardiac surgery, plastic surgery, gynecologic surgery, urology, head and neck surgery, vascular surgery, neurosurgery, transplant surgery, radiology, cardiology, digestive diseases, and cognitive psychology. CASIT's areas of focus include minimally invasive surgery, image-guided intervention, robotic surgery, and as mentioned above surgical simulation. The study of the science of learning in cooperation with the cognitive psychology department is an important component. The center also will have a telecommunication center where surgeons will be able to perform surgeries and provide consultations from long distances and actually participate in the operations remotely which we have done as far away as Italy. These new training technologies will result in the reduction of healthcare cost because of fewer complications, less painful surgeries, and a return of the patients to their normal lives more quickly. These technologies will limit surgical and other medical errors and improve telemedicine, telesurgery, and robotic surgery. The center will also serve as a training center for surgeons who are in practice and need to become certified in the new emerging technologies. The American Board of Surgery will require training in these technologies for certification. CASIT will provide objective performance based criteria for certification and to maintain credentials. We are only limited by our imagination. If we can imagine it, we can do it! The new 4000 square foot CASIT Center at Ronald Reagan UCLA Medical Center is opening soon.